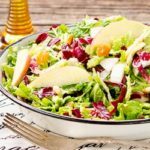 Autumn Crunch Salad combines flavors and produce of the season with a citrus dressing. It's a salad to make and take to potlucks and parties. Place mustard, honey, garlic, shallot, tangerine zest and juice, vinegar, salt and pepper in a blender. Blend on high speed until combined. Turn blender to low speed and slowly drizzle in oil. Combine cabbage, radicchio, Brussels sprouts, shallot, apples, pine nuts, and raisins in a large bowl. Pour dressing over salad and toss gently. Cover and chill for at least 20 minutes or up to 1 hour. Toss again just prior to serving.